How can you search any website contents without visiting that site? Did you know that you can search contents of any websites without even visiting that specific site? Well, let's talk about that in this post. You might be thinking why can't you use a search engine of that site? Of course you can, but what if that site doesn't have any search engine at all? Or maybe it has one but in desktop version only, and when you visit that site using a mobile then you can't find any search box like this site. To overcome that problem there is a simple solution and that is search it by using Google. Yes, you can search deep contents (not only titles) of a site with Google as well. As you probably have already seen in the picture above and worked out, but let me explain it if you didn't understand it fully. 2. The tag which tells the Google where to search. 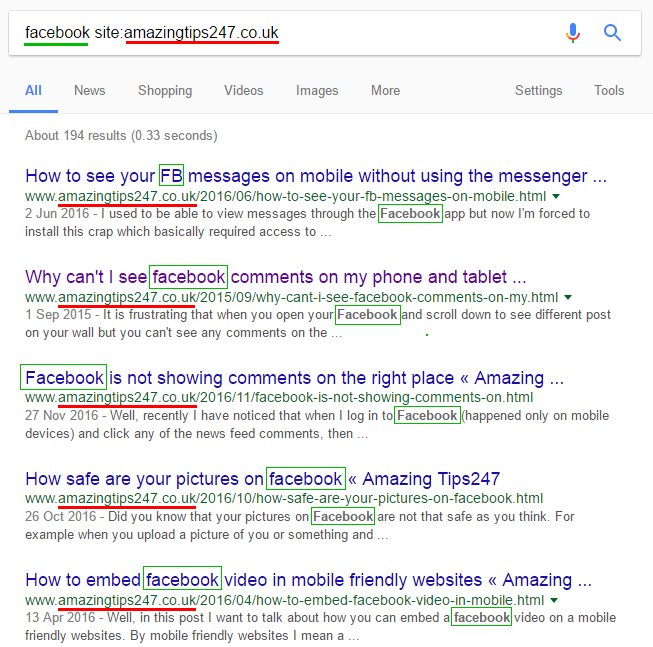 For example: facebook site:amazingtips247.co.uk Now as you can see green highlighted word is what I searched. 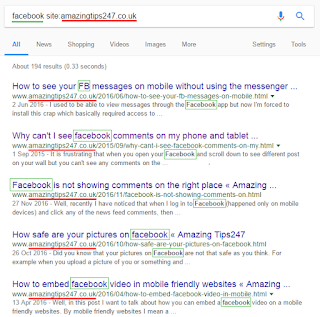 The yellow highlighted word (site:) word and the website right after it (amazingtips247.co.uk) told Google that I wanted the results from that specific website and not from other websites. Note: It's better to put www. before any website otherwise google may show you results of the popular website with that name first and might show results from other similar site too. And one more thing is that you can only a result if Google has indexed that site/page.